Because of the stigma of mental illness and systemic flaws that limit access to mental health care, people want less frustrating and more affordable paths to improving their mental health. Companies, academic researchers and government organizations are creating innovations in mental health care and technology to reach these consumers. In spite of these efforts, there are still millions of people who give up on improving their mental health because they are not aware of these innovations. By looking at the innovations below and spreading the word, you can present them with more options and offer another chance to live a happier life. Cost: In-office therapy costs an average of $75-150 per session (most sessions are weekly and last an hour or a little less). On the other hand, online therapy can be much less. Because online therapists don’t incur as many operating costs, they don’t need to charge as much. Inconvenience: It takes valuable time to commute to a therapist’s office. Most therapists work during business hours, so clients need to spend less time making money and stress more about what their bosses think. With online therapy, you can chat anytime and anywhere. Stigma: Because of the stigma of mental illness and therapy, clients worry about peers seeing them around a therapist’s office. Online therapy offers more confidentiality and some forms of online therapy, including Talkspace, do not require identifying information (name, health care information, address, etc.). Online therapy also reaches more clients by offering mediums of communication other than face-to-face interaction. It goes beyond live video chats. 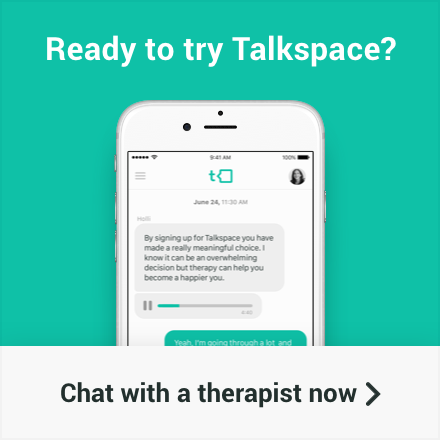 By using Talkspace, clients can send text, audio, video and picture messages to therapists. These mediums further dissolve the inconvenience barrier because clients don’t need to schedule a session to use them. They can send a message anytime, go about their day and then check to see if the therapist responded. This process can repeat many times throughout the week rather than picking one day for a session. Robots may not have the ability to act as therapists, but bots can help clients, clinicians and therapists with the processes involved in treating mental illness and improving mental health. 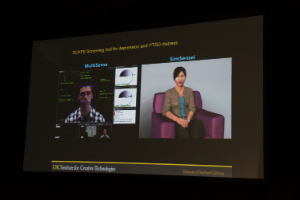 Director for Virtual Humans Research and USC Professor Jonathan Gratch demonstrated this at the Talkspace clinical conference, The Future of Therapy. Gratch introduced Ellie, an advanced bot that can have basic conversations with people. “Ultimately the goal is to try to elicit indicators of depression and part of our research shows that people actually disclose more to this kind of technology than they might when they’re talking to strangers,” Gratch said. 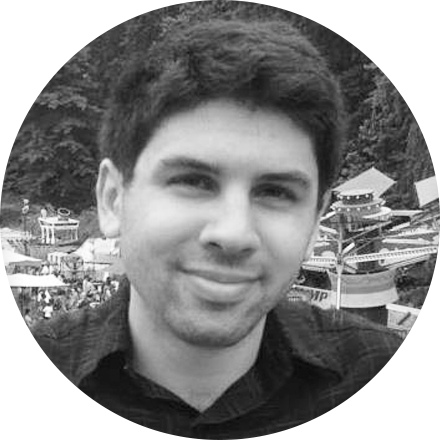 Gratch’s research is part of a general trend in using bots and artificial intelligence to allow people to open up more quickly. This is useful for efficiently collecting data during clinical research or screening people to help guide them to the right therapist. Robots can provide emotional and sexual fulfillment that make some people happier and satisfy needs humans cannot. This technology improves their mental health by allowing them to completely be themselves or live a certain lifestyle. 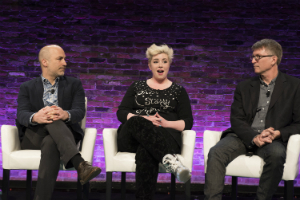 In the conference panel that included Gratch, BodAI Founder Katie Aquino talked about her company and how she plans to produce robots that improve mental health and mesh with different aspects of people’s lives. Using her company’s software, people would design robots that suit their needs and wants. “We kind of see it as you’re creating your own online dating profile, but for your BOD, for your synthetic partner,” Aquino said. Aquino also mentioned robosexuals, people who are sexually attracted to robots but usually do not have access to the technology needed to satisfy them. Being in a relationship or sexually active is usually part of living a happy life, so advances in robotics should improve the mental health of robosexuals and other members of small, stigmatized communities. Using a mobile app to text a therapist is a great way to manage mental health and tackle many issues at once. People also use apps that help them monitor a specific behavior or problem related to their mental health. Mobile Health Interventions is one of these apps. Users can set up automated systems that help them reach goals related to mental health such as motivation and gratitude. Taking medication for mental illnesses can be frustrating and time-consuming. Even after finding a psychiatrist or doctor, people need to coordinate refills, deal with health insurance companies and stand in line at pharmacies. Then there is the challenge of remembering when to take your medication and refill it. It creates a lot of stress (stress people sometimes need the medication for). Companies such as PillPack are trying to — among other goals — make the medication part of mental health easier for consumers. PillPack does all the coordination and refill work for people who are tired of it or have trouble fitting it into their schedules. It also delivers the medication to people’s homes and helps them remember to take it on time. 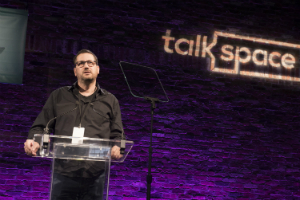 During his speech at the aforementioned Future of Therapy conference, Talkspace CEO Oren Frank talked about how health care has failed the American people. Frank chose the first option by allowing clients to use Talkspace without insurance and offering rates lower than most insurance-based rates and copays. He believed this would increase the quality of care and create a better experience. Then there are companies that work with the insurance system to provide better care to consumers. 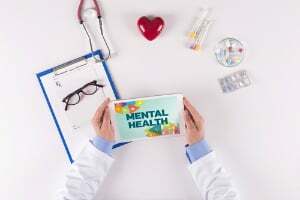 Most of them don’t stress mental health care as part of their brand, but they do help people connect with mental health professionals who can work well with their insurance. Regardless of strategy or primary goals, these companies are providing mental health care to people who didn’t have it before. Innovations only work, however, if people know about them. Take a moment to share this article or tell people about these companies. It could be their first step toward better mental health. Are we missing innovations people should be aware of? Email Joseph at [email protected] to suggest additional innovations or trends.